Welcome to all Banglalink customers to enjoy special Banglalink 500MB, 1GB & 2GB Internet With 100% Bonus Offer. Now all BL customers are eligible to buy this special internet bonus offer. 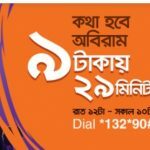 The customers who are use Banglalink prepaid connection you can get this special 100% internet bonus offer. If you want to know about this special internet offer with low price but exclusive validity, please read this full article to get all idea how can activate this offer. Banglalink all prepaid and call and control customers are eligible to enjoy this 100% bonus offer. Check your main internet balance and validity, you just dial *124*50#. To check your internet bonus volume and validity, customers need to dial *124*44#. Customers will use this data under the 2G/3G area network. Finally we hope that, all customers got a clear concept about the Banglalink 500MB, 1GB & 2GB Internet With 100% Bonus Offer details. If you want to know more or face any problem to activate this special internet offer, please comment the box. We will answer as soon as possible.